Maintenance Connection's new Geospatial Information System (GIS) connector will enhance the use of its industry leading maintenance management (CMMS) software for cities, utility districts, and organizations with distributed infrastructure. Adding this functionality will enhance Maintenance Connection’s presence with customers requiring GIS, such as municipalities and water districts, who typically need this capability included in their CMMS platform. Maintenance Connection has just launched a new Geospatial Information System (GIS) connector to enhance the use of its industry leading maintenance management (CMMS) software. This GIS connector will help cities, utility districts, and organizations with distributed infrastructure manage their assets and work geographically and make more informed business decisions because of its ability to capture, analyze, and present business intelligence data that is linked to location. GIS lets users visualize data in various formats using maps options, including aerial and street view, and to easily locate and manage their assets. 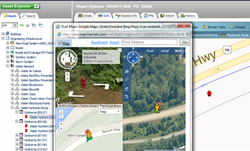 Maintenance Connection built the GIS application using the input from both existing and potential customers and developed a solution that works with ESRI, AutoCAD, and many standard GIS platforms easily. After an initial beta process, the tool has been utilized successfully and made available as an add-on to the CMMS solution. This intuitive interface gives users the ability to manage workflow, leverage GIS data, and improve the way they do their job. “Adding this functionality will enhance Maintenance Connection’s presence with customers requiring GIS, such as municipalities and water districts, who typically need this capability included in their CMMS platform,” said Brad Squires, Vice President. Maintenance Connection has a team of GIS experts who are well-equipped to assist with the implementation of the connector. They are uniquely positioned to conduct setup, including configuration, data mapping, and training for organizations that use GIS data. Implementation services may range from cleaning up data, mapping fields from GIS, and training staff about ways to manage the tool. Contact Maintenance Connection for a demonstration of the GIS connector and see how this add-on can benefit any organization requiring GIS at sales(at)maintenanceconnection(dot)com. Maintenance Connection is a rapidly-growing company that is leading the way in maintenance management using pure browser technology. Maintenance Connection delivers a full-featured web-based maintenance management (or CMMS) solution including Work Order Tracking, Preventive Maintenance / PM Software, Asset Management, Inventory Tracking, Procedure Library, Labor Scheduling, and Service Requests, all available through the Internet using a web browser or a company's local network. Maintenance Connection offers a unique and intuitive user interface built on a robust database infrastructure, all at a highly competitive price point. For more information about the company and products, visit http://www.MaintenanceConnection.com.